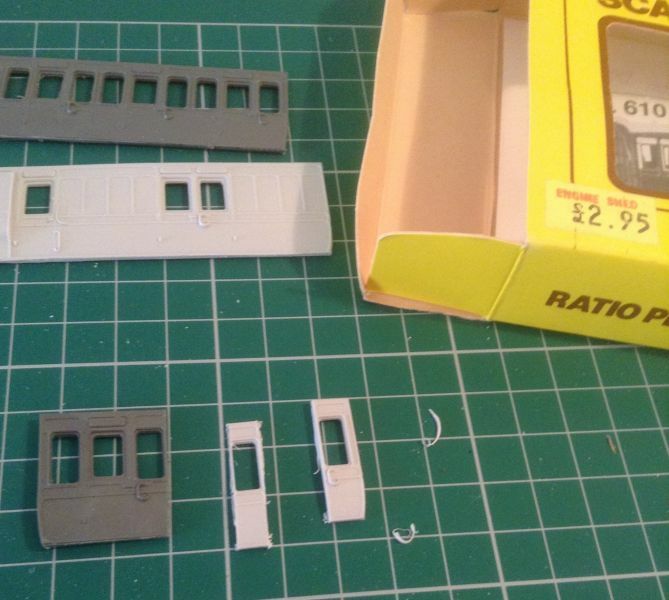 Since the 1970s I’ve been a fan of the Ratio four wheel coach kits, simply because, way back then, they offered the detail not available from the RTR guys and I still have a rake I made all those years ago, together with a quantity of unbuilt kits. They also lend themselves to the pastime of ‘cut and shunt’ and one can shuffle the panels to model a number of different diagrams, provided the correct source documents are to hand. John Lewis’ Great Western Auto Trailers Vol 1, has many excellent photographs and drawings to help get the right detail, as does Russell’s Great Western Coaches Part 2, but I was inspired to carry out this project by Nick Wood of Much Murkle fame, who has made this delightfully different two car ‘Clifton Downs’ auto trailer set which I’ve seen in action a couple of times at exhibitions. 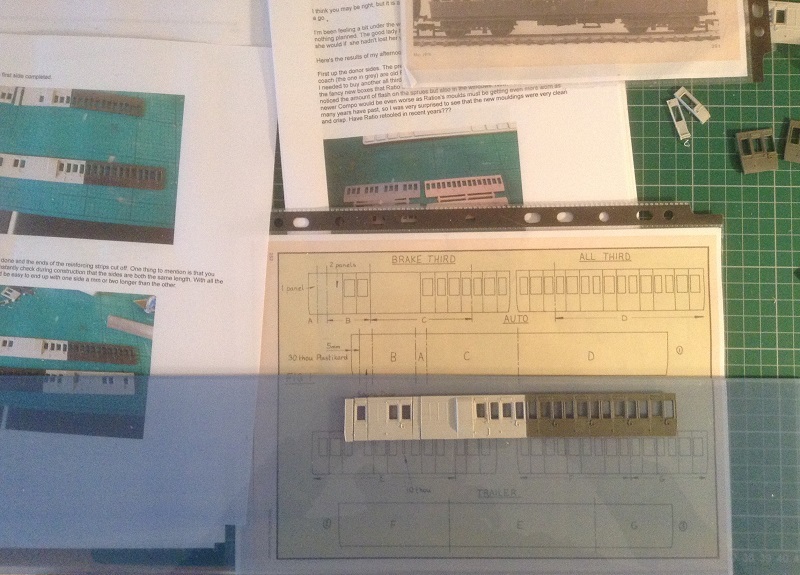 Nick also kindly provided a copy of John Ely’s Model Railway Constructor article on the conversion from1979 and once I’d sourced two pairs of Dean 8’6” bogies, I thought I’d make a start. So here’s a brief summary of progress to date, comprising much and enjoyable research followed by a couple of modelling sessions. An important note on tools before butchery commences. You absolutely need a firm working platform, very good light and most importantly, a good quality model making mitre block and razor saw. Following the principle of the firm platform, I clamped my aluminium mitre box into a laptop work-mate device. This means that as much risk of a coach side moving and therefore ruining it while cutting was minimised. I started on the more complex driving car first and show the six part left hand side laid out on a glass plate below. I need to fit a new grab rail to the right of the driver’s door and probably reduce the width of the front panel a little. This is an amalgam of two kits, a Third Brake and an All Third and the photo below shows all that is left for the spares box. Note how much a coach kit cost around the time as the MRC article! I’m pleased enough with the results so far, although I’m still pondering on how much detail to attempt, following close study of prototype photography. I’d like to try the guard lookout windows, which should be an interesting challenge, particularly with restriction from the thickness of the plastic sides. I suspect the Roxely Mouldings etched brass kit has these off pat, so my thinking cap is on. I’m off to the UK tomorrow for a week, so my apologies in advance until the next post. I'm really pleased to see you made a start on this project. I found it a really enjoyable and satisfying exercise when I kitbashed mine some time ago and the set runs frequently in Much Murkle's exhibition sequence. I often get asked about these coaches as they are not well known even amongst GWR modellers. I'm just returned from the UK with a stinking cold, more plasticard, extra thin liquid poly (thought I'd try attaching soleplate rivets) and a pair of those new Peco bullhead points and a box of track. They look so much better than previous offerings, but I digress. So am back to the cutting mat today and hope to post an update over the weekend. First though, a thank you to all who looked at the opening post and also to Nick and Peter for your comments. Your conversion Nick, showed me what is possible using Ratio sides and I hope to do the job justice, so we’ll see soon enough. As for you, young Peter, if you’re able to line up several glasses of good French wine in the correct order to best enjoy them, then cutting and shuffling the Ratio sides into shape will seem an easy game for you! Interestingly, while researching, I came across a photo of a clerestory auto trailer which I’d like to follow up and probably use some of the Triang clerestory stock to produce a reasonable model. So back to the cutting room . . . .
Glad you're back home Bill but I do hope your cold isn't like mine - it's already 6 weeks old and still going strong !!! Hey Peter, that's some serious cold. So sorry and best wishes for your recovery and yep, after those first three glasses, who cares. Good point ! 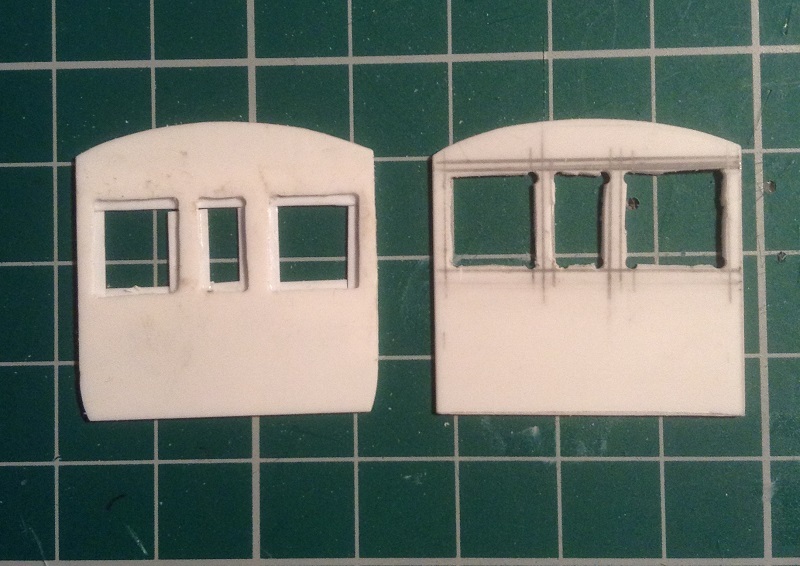 The previous session had the left hand side of the driving trailer cut, panels shunted and lined up on the glass, so now I’ve done the same with the right side (at the top of the second photo below). A little more confident from the first one, I departed from the John Ely order and used the All Third side intact. This then nicely butted up against the guard lookout to easily hide that joint. It also staggers the joint with the other side to aid overall strength of the completed unit. I just need to par off the beading from the end of the All Third at the lookout position and fill the small gap near the soleplate. 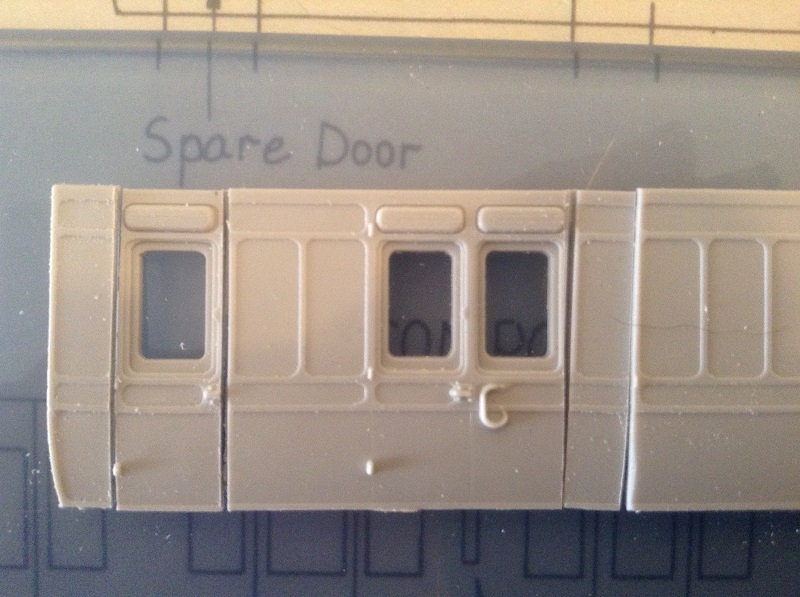 I overcut two of the panels to retain moulded door hinge details and will file back carefully later, but I’ve only just noticed, while loading these photos, that I’ve cut the single solid panel to the left of the double luggage doors, with the beading to the right, not left as required. The next photo is cruel at this degree of enlargement! 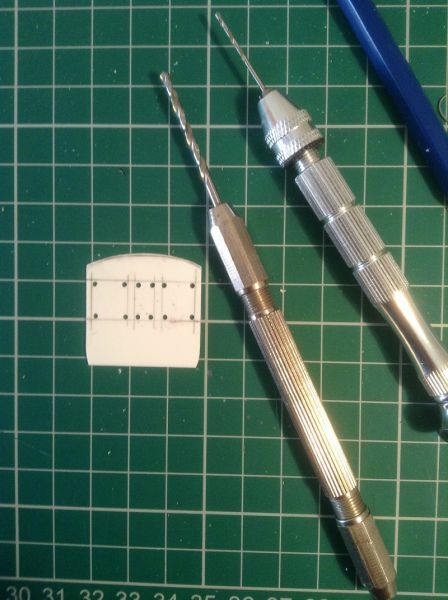 The fix is easy enough with a sharp blade and styrene strip and will be good practice for the next error I make. While looking at this enlarged photo, note the end panel in front of the driver’s door. 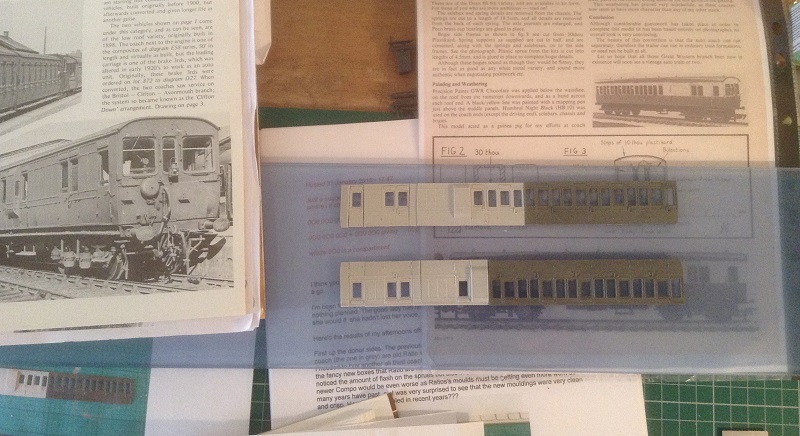 The John Ely model has a plain styrene panel here and at first, all the photos I saw in my reference books had one with panels matching the rest of the carriage. 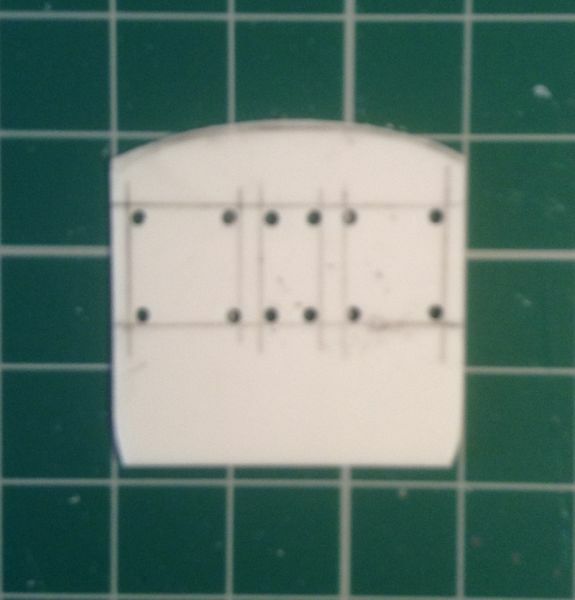 I therefore used a similar panel from the Ratio kit, but again when loading the photos, saw a unit with this plain panel. Look at the first photo of this post to see what I mean. I need to carry out more research to determine exactly which driving trailer I wish to represent and insert an appropriate panel. I ended today’s (Saturday) session by cutting out the front end in 30 thou sheet, together with a buffer beam cut from the unused Ratio end. I’ll mark and cut out the windows tomorrow and model the basic details, but leave the finer stuff until the unit is assembled to avoid damage. What is the kerf on the saw? By the look of things you have 3 cuts on one side, 5 on the other. You might need to adjust the length of the longer side to get it square with the other (bin there, dun that). Do you have a gong for the end? PM me if you don't, I have some spares you can have if you want a couple. Ratio seating strips are available for these carriages. Five cuts per side and the kerf is less than 1mm. I have panels on both sides to reduce to their correct shut lines, using very fine abrasive paper stuck to a flat plate and I'll be assembling the sides over longitudinal reinforcing strips, so have the ability to place the panels for overal dinensional accuracy. This is my first cut and shunt, so I hope my method overcomes any initial cutting inaccuracies. The trailer car should be much easier with two cuts per side and while I know I should of started there, I fancied the challenge! I have some Ratio seat packs and although I aquired a spares auto coach with the last Dart Castings detail kit from ebay, it had its gong missing, so I'll most gratefully accept your kind offer and send a PM over. I'm looking forward to the detailing stage and have some extra thin poly solvent to hopefully get neat 10 thou cube rivets and reinforcing plates in the right places. Now that will be a challenge! Apart from the buffer beam, the driving end is scratch built, so care was taken and with the words of my sadly departed father-in-law, once a carpenter and joiner, of ‘measure twice and cut once’ affectionately ringing in my ears, I took up my tools and began. The photos speak for themselves. The end being cut from 30 thou styrene sheet. These enlarged images make the job seem straightforward, which it is really, except the workpiece is rather small, the following photo giving some scale from the pin vices. The thing is that I was not using my usual big illuminated magnifier and I thought the window openings were cut out to an acceptable tolerance, until of course, I just saw these photos! The 3 foot rule will almost certainly save me though, provided the bolections when secured to the yet to be added window frames, hide the hideous file work! If not, it’s out with the magnifier and finer files. I need to stay in for a delivery tomorrow, so not sure when I’ll get back to the work room, but will add window frames and bolections, then prepare the sides for gluing. Those Windows are a lot of work. I gave up in plastic and went to brass sheet when I had a go at these (I also used the old clerestory coaches as donors and used the bogies). Easier to get the radius in the corners and of course to solder on the frames. One trick is to draw it up on the computer, print, then glue to the inside of the styrene (or brass). What paint scheme are you going for? It was cold in the work room today, really cold, it being well below freezing outside, so a shorter stint of modelling until my fingers turned numb! Yes Nigel, I think brass is certainly the way to go for the driving end, although now I’ve got the styrene end almost good enough, I’ll stick with it. The Russell book shows plated over ends and leading side panels, while Lewis also has examples with overall panelled construction and as the front is plated, I’ll now make up replacement plain short side panels to match the driving end. Regarding paint schemes. I’m slowly assembling stock rosters for both 1920 and 1930 periods (rail and road traffic) and ideally would have two Clifton down sets and may well make another in future. This one however, will carry the simplified 1930s livery. 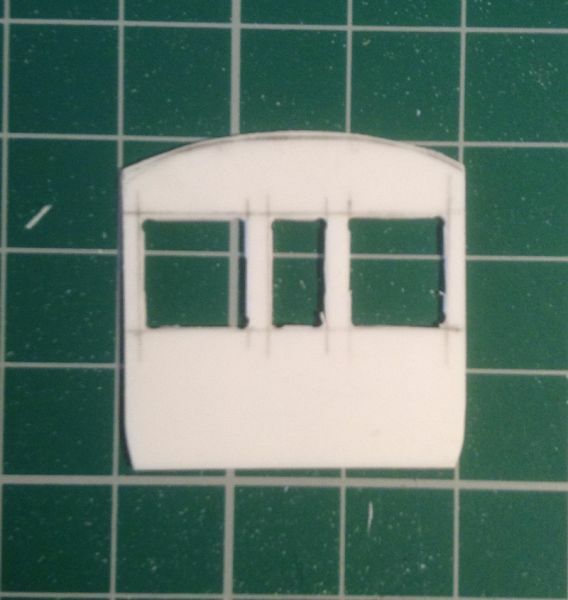 I cut out a 30 thou styrene floor and two sets of 3.2mm angles for the soleplates and footboards, but the I’m not particularly happy with the fragility of the floor, so will investigate something stronger. I thought of using brass and I also have both 50 and 70 thou plasicard. Seats and partitions will help stiffen the structure if plastic is used. Some experimentation will be required tomorrow. I don’t however have any brass sections for soleplate or footboards, so would have to see how successful fixing plastic to brass might be. Any thoughts? Plastic to brass - plastic-compatible CA with some screws just to make sure, Roughen up both surfaces and use slow setting type.Thread the brass, use I beams with the screws on the inside. Thin coat of epoxy with screws works as well. 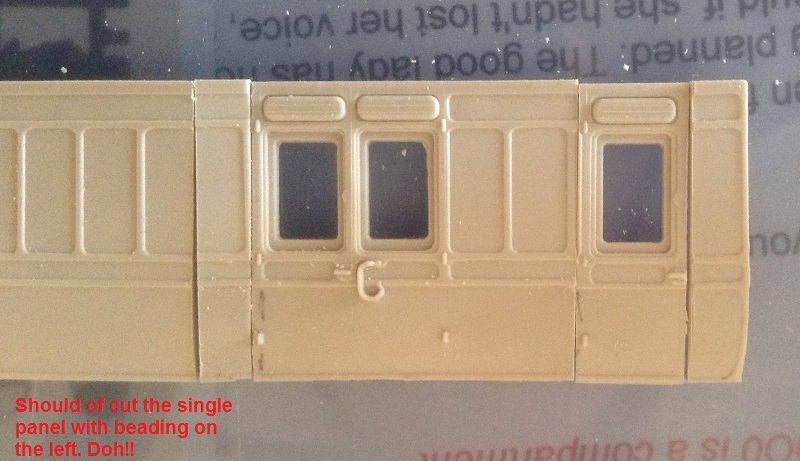 I think the windows on the end need to be higher that the ones on the sides, and the guards door windows need to be lower to match the compartment windows. One of the issue around using the Ratio kits. Minor details, that is looking really good so far. Simplified scheme. Phew, I thought for a minute you were going for the 2-tone panels. There is a technique for that (one I never mastered but tried many, many times). 1920's would allow crimson lake (lake 1912) up to about 1930.. Ignore the lining out of the panels though. It looks to be progressing nicely. In the last photo the end looks really good, I would like to see a close up of it please. I bought a Silhouette cutter a little while ago and if I were building this set again now I would use that to produce the driving end. It will cut 10 and 20 thou styrene from CAD drawings done on the supplied software and would cut the windows with the radius accurately. If you need it thicker then you just cut the required number to make the right thickness and laminate them together. I like the idea of having two sets in different era liveries but I'm not sure of the dates that these sets were converted. I have the necessary reference books to check but they are packed away for the next few weeks whilst we redecorate the house. I would stay with plastic for the floor personally. If you use a fairly thick sheet, once the solebars and sides are in place then it should be rigid enough. It also has the benefit of using the same glue throughout. 1913-1916. Eight conversions of Diagram E58 to autotrailer driving cars. Probably in utility Brown for some of them. Thanks Nigel. I could remember there were eight sets converted but not the dates. All over brown would be an interesting, and easier variant. Not much modelling today, as the bride’s caught my cold and as I’m feeling slightly better than she is, I tucked her up and stayed nearby most of the day, serving cold remedies, tea and sympathy. Thanks Nigel for the plastic to brass glue tip. I’ll be adding it to my notebook as I’m sure I’ll be needing it. You are quite right about the height of those end windows. Annoyingly I knew it, but fell into the mistake of wanting to get on and not checking how it looked against the sides as I went along. The quick and easy fix was to add a narrow strip to the bottom and cut a lower roof line. Simple but as I was looking through prototype photos, I became increasingly unhappy that the front just didn’t capture the look of the real thing. I didn’t shy away from the 1920s panelled livery, sans lining, with my 35 year old previous effort on a rake of Ratio 4 wheelers. I should fish them out and put them alongside the Clifton Downs set when ready and see if they’re still creditable. If so, then I’ll try my hand again with the next coach bash. Nick, I’ll not be using the front end from previous posts, but there’s a photo of it against the part built replacement below. If I like it when I get the window frames in, I’ll use it, otherwise, Mk3! I like the idea of a Silhouette cutter and can see some good uses for it, such as not only a 30 thou front end, but also the 10 thou panelling to stick onto it. It would need to be worked hard enough to earn its keep however. This photo is very much work in progress and cruel in the way close-ups are, but shows the Mk1 end alongside the possible replacement. Bear in mind the original is a quarter size of the photo and when the openings are trimmed and the window frames fitted, they'll seem much smaller. I'll hopefully find time to do this tomorrow, then we'll see whether Mk3 is required. Hmm, that reminds me of our conversation at the Eastleigh exhibition Nick, when I envisaged the possibility of making several front driving ends! Be careful what you wish for !!! The bride and I have still been sharing the family cold this past week, previously all mine, but it’s good to share and we've hunkered down indoors to enjoy only the sight of snow, as we’ve been content to mainly rest indoors, but alas away from my work room. Today however was an interesting model railway day. Following earlier email exchanges with Hattons, regarding an overdue Dean Goods loco and a promise of a replacement after a further wait, the original arrived this morning, as did a special gift from another railway enthusiast. Oxford Rail’s unlined green Dean Goods is a great looker and I was very impressed with the highly detailed cab interior and very fine small details. Unfortunately, so fine that the distinctive tender fire irons hook was broken and rather than send me a couple of replacements, I need to return the loco, accept repayment and then pay again for new one. An unusual system, but as I’ve waited over two years for this one, I can jump through some hoops and wait a little while longer for a perfect example. I did manage to escape for 20 minutes to the work room this afternoon for some fettling on the Clifton Downs driving end. Emery boards soon had the openings to an acceptable standard and I got half the window frames in. The icing on the cake though, was an offered-up warning gong, received from Nigel and it looks, well, perfect really. You have brownie points Nigel and the bride joins me in offering sincere thanks for your kindness. I’ll do some more tomorrow and make a further report soon. So I told the bride I would be half an hour in my work room, then got stuck in cutting and fitting the trickier sections of the window frames and time was forgotten. I spent a whole hour getting just two 10thou frame sections tightly butted up against their neighbours. I didn't want to see as much as a gnats whiskers gap, so just hope they look okay when dry and I get my magnifier out! I'm watching this interest Bill. A great project for a unique coach. I see you were struggling with the driving end. I might try making it composite by gluing it together in several pieces. That way you can get your lines straight. 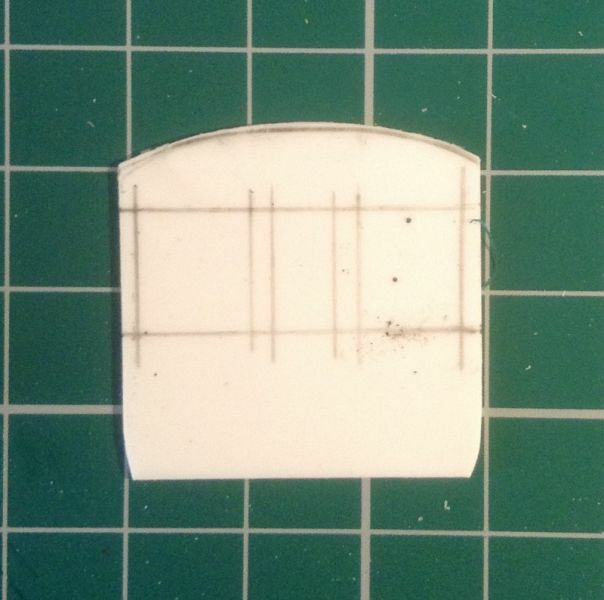 Perhaps some 0.5mm card at the back for reinforcement. 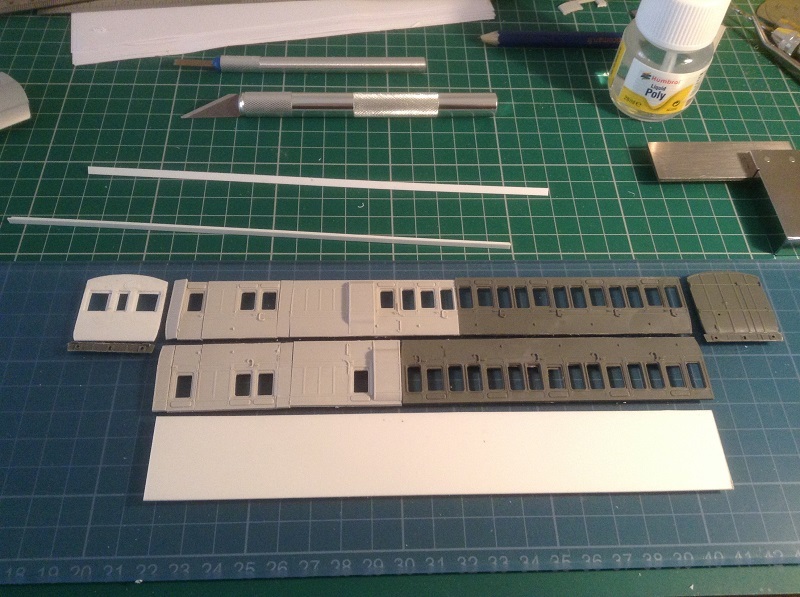 Not so much struggling John, but more a case of me setting myself high standards, combined with first time scratch building such an important element of rolling stock! It's great fun and I'm not rushing it, but hope to make better progress next week. Forming the bolections with 5 Amp fuse wire is next and should be even more fun.